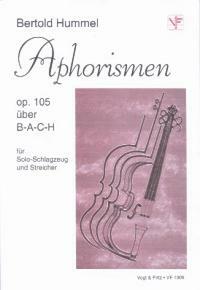 "Aphorisms on B-A-C-H" for Percussion solo and Strings, Op. 105 was a commission for the Hamburg Camerata in 2000. In 5 movements, the tone series B-A-C-H (English: B-flat - A - C - B) is present throughout (in basic form, inversion, crab and crab-inversion as well as in transpositions of these). 1. Four tubular bells (B-A-C-H), commented upon by metallic and wooden sounds, open the Prologue; the "theme" , presented by marimba and violins, undergoes in the development a number of metamorphoses, until, towards the end, the four tubular bells signal the close of the movement, fading away in extreme pianissimo. 2. The Burlesque entrusts gestures of the "theme" to wood and membrane instruments in a turbulent dialogue with the strings, which also function occasionally as percussion. The grotesque game is actually brought to a stop by the whistle. 3. In the 3rd movement, (Recitative and Chorale), the Chorale "O Haupt voll Blut und Wunden", sounding in the strings, stands in tense contrast to the recitatives of the percussion, which are extracted from the B-A-C-H material. 4. The lntermezzo brings something like a picture puzzle of the 1st Minuet from the Little Notebook for Anna Magdalena Bach, a reminder of my first encounter with the music of Bach, set amongst manifold variations of the principal theme. 5. In the Coda, a velvet marimba and string sound dominates. A short Passacaglia leads into a 12-part chord; as this dies away, we still can hear traces of the B-A-C-H motif on the tubular bells mixing with the chord. A very quiet close with an almost imperceptible string glissando. "This piece could become, like Hummel’s "Concerto for Percussion" op. 70, a popular addition to the repertoire, for it makes very attractive use of the capabilities of metal, wood and membrane instruments. It is technically demanding for the player, first class entertainment for the listener." " ..a delight for the ear ...", "...produced uproar in the audience ...", "the applause just wouldn’t stop ..."